Don’t sharks BREATHE through their gills! I don’t think you’d be dong muck walking without lungs! As a matter of fact, yes, gills serve a purpose similar to lungs in that they facilitate the transfer of oxygen from the surrounding fluid into the organism’s bloodstream. The advantage, of course, for a creature living under water is that gills can accomplish this without leaving the water, whereas lungs force a dolphin to surface periodically. 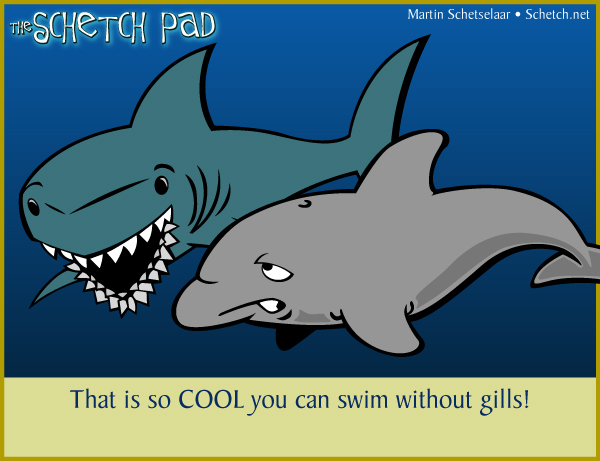 Our shark could very reasonably argue, then, that gills are superior to lungs for swimming, much like the able-bodied like to argue that having two hands, two feet, hearing, or sight (or whatever resource we want to call “normal”) is superior to living without it. However, as you so ably pointed out, the fact that dolphins lack gills does not mean they lack a way to breathe. Lungs aren’t so great at extracting oxygen from water, but they do have the alternative advantage of being able to carry a stored supply of source fluid (air) wherever they go, as long as they do return to the source periodically. Gills can’t do that. Similarly, things we call disabilities have a way of giving a person a perspective on the world that the able-bodied don’t usually get to taste, and there are advantages to that, too.